Whether you spend life on the road for pleasure or work, it’s nice to have the comforts of home as you travel the highways and byways. TRAILBLAZER checks in with folks who spend a fair amount of time on the road to see just what makes their home away from home. 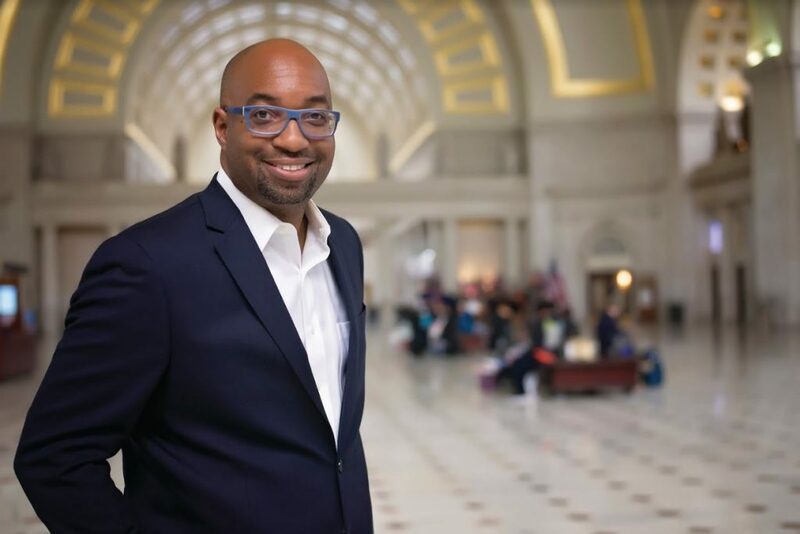 This month, we chatted with poet, educator, and children’s book author, Kwame Alexander. 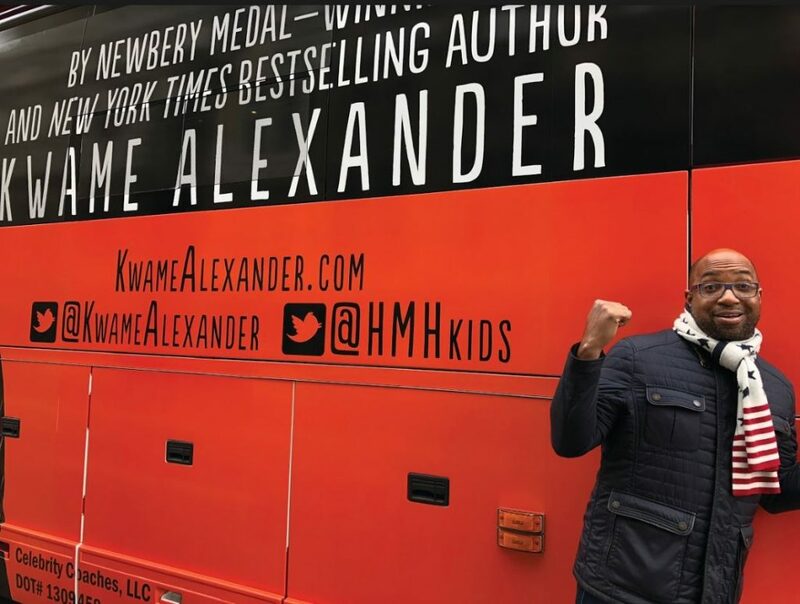 Poet, educator, and New York Times bestselling author—there isn’t much Kwame Alexander hasn’t done. And now he can add rock star to his resume. 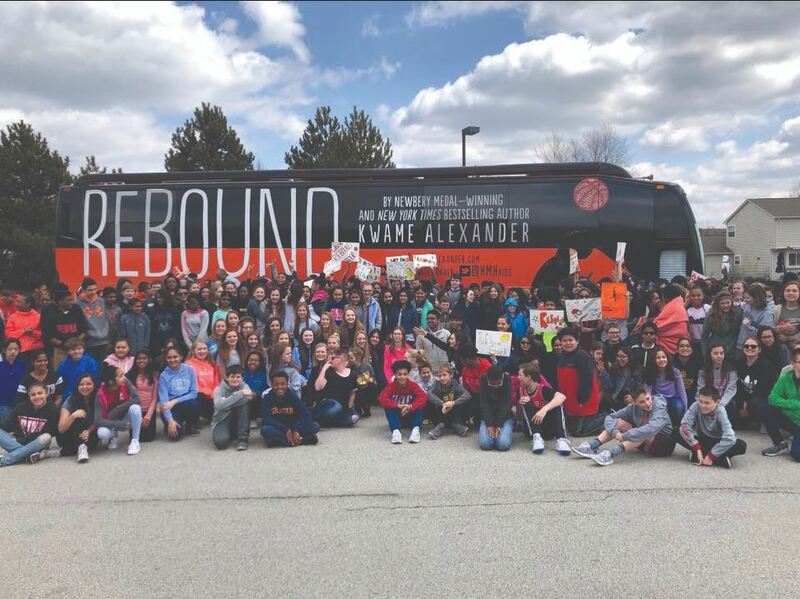 With more than two dozen books to his credit—mostly young adult and poetry—Kwame’s 2018 publication of Rebound followed up on his Newbery Medal award-winning middle school novel of family and brotherhood, The Crossover, and is a sensation with kids, teachers, and educators across the country. With a publisher for a father and English teacher for a mother, Kwame grew up surrounded by literature, poetry, the black arts movement, and adult conversation. After studying with poet Nikki Giovanni while a student at Virginia Tech, he soon realized that being a poet was his calling, which then morphed into being a poet for children and young adults. His goal was to help bridge the gap from children’s books to Shakespeare. He felt that relatable, fun, and rhythmic verse would help kids cross over to poetry and literature. Many books of poetry, basketball-inspired rules for life, endangered animals, and sports later, Kwame turned his attention to fiction with the publication of The Crossover and Rebound. Set in verse, Kwame’s novels appeal to young adults through their topics, themes, and, yes, hip-hop rhythm. So, in early 2018, he decided that he wanted to take his message to the kids in a new and novel way. And what better way to do that than to pull up to schools and public venues in a tour bus—complete with a full wrap of his book cover and high-energy music blaring from the speakers announcing his rockstar arrival. And, so, the Rebound Tour was born. We caught up with Kwame shortly after he returned home from his month-long tour. What made you decide to take the Rebound story on the road? And in a bus, no less. I’ve been touring 20 years or so. [Being] face to face, interactive, upfront, [and] personal with my fans and my readers has always been my way of being able to engage and connect. I love performing as much as I love writing. The touring aspect has always been part of my modus operandi. The idea of a bus sort of began as an ego thing. I’ve seen authors and rock stars with buses. I’m putting on a show for students, teachers, and parents. It’s poetry. It’s performance. It’s live music. It’s essentially a one man show. After I got over the ego thing, then it just seemed to be practical. Books are selling, so let’s enhance the brand and build even more buzz by taking this and running with it. People tell me, “Kwame, you’re the rock star of children’s lit.” So, let’s take that and run with it. Let’s see if we can up that brand—that buzz—even more and sell more books and create more interest –and to, ultimately, get kids more excited about reading. After that, it morphed into my mission to make books more cool. I feel like I’m the ambassador of literary coolness. I self-appointed myself that. What better way to represent that than a huge tour bus with the cover of the book wrapped around it. And then the last thing was that—with 119 events—it seemed practical. What kind of bus was it? Was that your first time in an RV? In real life. I dreamt about it forever. My wife and I had been talking about when my daughter graduates high school, we’d get a pimped-out RV and travel the country. But this is the closest—and I’ve got to say, pretty darn close—that I’ve been able to be on this bus for 29 days. But, yes, it was my first time on a tour bus. I told my publishers—and my Dad—after like Day seven, that I never want to fly again. This is the way to do it. We did 119 events in 29 days. To be able to do a gig, expend all this energy, put on the best show you can, and then literally go outside the venue, get on the bus, get into a chair, have a glass of sweet tea, listen to jazz, talk to your friends, and then go take a nap is the thing to do, as opposed to having to go to the airport and having to go through security. It’s the most relaxing chill—and you’re still moving. I never want to fly again. This is how I’m going to tour from now on. Who traveled on the bus with you? 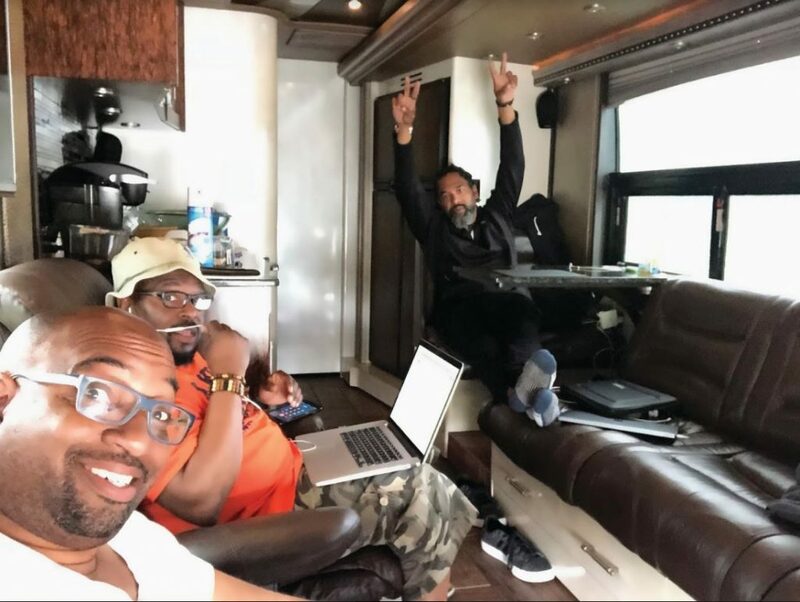 Consistently myself, my guitarist, Randy Preston, and our road manager, Hafeez Wootson—we call him The Feez—along with a night driver and a day driver. The bus sleeps five. It has two sets of bunk beds and a master bedroom. You walk in and you are in the family/living room area with a leather couch, two leather chairs, and two flat screen TVs. After that is the kitchen with cabinets, a sink, microwave, fridge and freezer, a little dining room counter, and nook. After that is a half bath. Then there is an electric door that leads to two sets of bunk beds, each with a TV so there are four TVs. Then there is another electric door and then the master bedroom with a bathroom, shower, king bed, another TV, two closets and eight or nine drawers. There is a music system in the living room and another in the master. There is also Wi-Fi throughout the bus. What’s your favorite thing about staying on your bus versus a hotel? I’m a huge multi-tasker. I function on a lot of different levels. And at any given time, I’ve got a book that I’m writing, I’m preparing for school visits, I’m running a publishing imprint, I’m working on some scripts. I’m raising a family. I’m doing a lot of different stuff. Lots of people ask me, “How do you do all that?” One way that I do it all is that I take naps. I’m a huge nap person. The most thrilling thing about this bus is that we could be moving from city to city or from gig to gig and I can get a nap in. It really helped in my productivity and in getting everything done. What are your three favorite things onboard? Definitely, my bed. There was one chair that was my chair. No one else could sit there. That chair was really important to me. And the third thing would have to be the company. We know that music is integral in your life and your writing. What do you listen to on the road? We listen to a lot of house music. A lot of bass. Really up tempo. Deep spiritual lyrics. That got our juices going. We listen to a lot of jazz music, especially when we were working. We rehearsed a lot on the bus. We had an awesome sound system on the bus, but it was more like background music. Your tour schedule is grueling. What do you do to unwind? You grew up playing tennis and obviously love basketball. Do you ever stop to play when you are traveling? We played basketball with kids at schools. It reminded me how old I am. I’m reading an adventure novel by Nelson DeMille called The Cuban Affair. And I’m reading a middle grade novel called Bud, Not Buddy, by Christopher Paul Curtis. Well, we microwave. We warmed up food. That’s the same thing, right? I gained six pounds. All that eating out. Any favorite places you like to eat on the road? We went to a lot of local spots. There was this amazing breakfast spot in South Bend, Indiana. In Charleston, South Carolina, the shrimp and grits at Magnolia’s. Indulge Cupcake in Atlanta. Some great Tex-Mex in Houston. Some of the best seafood ever at The Breakers in Palm Beach. This soul food restaurant in Chapel Hill called Mama Dip’s. What are a few favorite destinations? Palm Beach, because I was with the family and we had beautiful weather and we had just come from up north where it was snowing. Savannah was really nice. The Chicago area. The Umstead [Hotel and Spa] in Cary, North Carolina. Did you ever camp or RV as a kid or as a family vacation? Once with my cousin for the World’s Fair when I was 10. Think you will you ever take your family on an RV vacation? Do you still have the bus? Nope. The bus [was next] with Bob Weir and the Grateful Dead. You’ve won some amazing writing awards in the past few years. What’s your most prized professional achievement to date? It would have to be the Newbery Medal. That’s the one that changed my whole writerly life. Is there anything about your bus or your life on the road that we didn’t ask that you would like to share? The more I was on the bus, I began to feel as though I was a rock star. Which in turn made me feel even more responsible to make sure that I am using whatever sort of celebrity I have to engage and inspire and empower children to want to read and, ultimately, through reading, imagine a better world.